Genghis Khan was the creator of the Mongol nation and the founder of one of the greatest empires the world has ever seen. Genghis Khan, whose original name was Temüjin, was born near the river Onon in the northeast corner of present-day Mongolia. When he was nine years old his father Yesugei took him to another tribe to find him a wife. 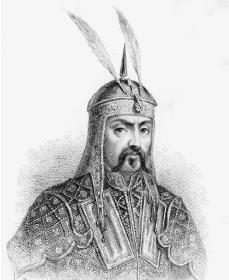 On the way back Yesugei was killed by the Tatars, who in the second half of the twelfth century had displaced the Mongols as the strongest tribe in eastern Mongolia. Yesugei's followers deserted his widow and children, who were then forced to live in conditions of great hardship. Temüjin survived by hunting and fishing. Temüjin began to attract followers who liked how he handled himself in battle. He became a follower of Toghril, the ruler of a Christian tribe in central Mongolia. Toghril and a young Mongol chief named Jamuka helped Temüjin rescue his wife, who had been captured by the Merkits, a tribe in present-day Russia. Some of the Mongol princes named Temüjin as their ruler, giving him the title of Chingiz-Khan (Genghis Khan), or "Supreme Ruler of the Ocean." Genghis Khan and Toghril later helped North China in a successful battle against the Tatars. Relations between Genghis Khan and Toghril worsened and eventually led to open warfare. Genghis Khan was defeated in the first battle and withdrew into a remote area of northeastern Mongolia. In 1203, however, he gained a complete victory over Toghril, who fled and was killed by the Naimans. Toghril's people were absorbed by the Mongols. Genghis Khan now turned against his enemies in western Mongolia, including the Naimans allied with Jamuka and the rest of the Merkits. The Naimans were defeated in 1204. Jamuka was soon given up by his followers and put to death by his former friend. In 1206 a group of Mongol princes proclaimed Genghis Khan supreme ruler of the Mongol peoples. Genghis Khan did more than just invade and conquer. He established a code of laws for the empire and a standard written language for his people, and he set up a kind of postal system to help different parts of the empire communicate with each other. His greatest skill, though, was as a military leader. In 1211 the Mongols began a full assault on China by invading the entire region north of the Great Wall. In the summer of 1215 Peking, China, was captured. Leaving one of his generals in charge of further operations in North China, Genghis Khan returned to Mongolia to devote his attention to events in central Asia. Küchlüg the Naiman, who had taken refuge among the Kara-Khitai, had overthrown the ruler of that people and taken over that kingdom. An army sent by Genghis Khan chased him into Afghanistan, where he was captured and put to death; the takeover of his territory gave the Mongols a common frontier with Sultan Muhammad, the ruler of Khiva, who after recent conquests had claimed all of central Asia as well as Afghanistan and the greater part of Persia. It was only a matter of time before the two empires went to war; it began with the execution of some of Genghis Khan's supporters and merchants accompanying them at the town of Otrar. Genghis Khan set out for revenge in the spring of 1219. By April 1220 he had captured Otrar as well as the cities of Bukhara and Samarkand. Genghis Khan sent his two best generals in pursuit of Sultan Muhammad, who fled across Persia and was killed on an island in the Caspian Sea. Continuing westward, the generals defeated an army of Russians and Turks before rejoining their master on his journey homeward. Genghis Khan, in the meantime, had attacked and captured Termez in the autumn of 1220 and spent the winter in what is now Tajikistan. Khurasan. He sent his son Tolui (Tulë) to complete the takeover of that province, which has not fully recovered from the damage to this day. Genghis Khan advanced through Afghanistan to attack Sultan Jalal al-Din, the son of Sultan Muhammad, who had defeated a Mongol army near Kabul. He fought with Jalal al-Din on the banks of the Indus; the sultan escaped capture only by swimming across the river. Jalal al-Din's defeat concluded the campaign in the west, and Genghis Khan returned to Mongolia. In 1226 he resumed war with the Tanguts, a Tibetan people. He died, with the war still in progress, in the Liupan Mountains in Kansu on August 25, 1227. Greenblatt, Miriam. Genghis Khan and the Mongol Empire. New York: Marshall Cavendish, 2000. Grousset, René. The Conqueror of the World. New York: Orion Press, 1967. Lister, R. P. Genghis Khan. New York: Stein and Day, 1969. Reprint, Lanham, MD: Cooper Square Press, 2000. Taylor, Robert. Life in Genghis Khan's Mongolia. San Diego, CA: Lucent Books, 2001. HE SOUNDS SO COOL!!! WE HAVE TO WRITE A REPORT ON HOW BIG HIS EMPIRE WAS AND WHY WE THINK HE'S A GOOD OR BAD PERSON AT SCHOOL. THESE PARAGRAPHS HELPED ME SO MUCH!!! THANK YOU!!! I have to write a report and this helped me. why does your image of Chinggis Khaan look like a Caucasian? He's supposed to be Mongoloid.